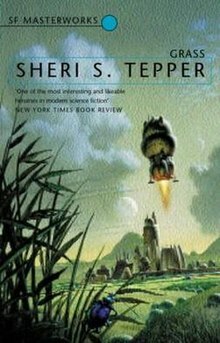 Grass is a 1989 science fiction novel by Sheri S. Tepper, and the first part of her Marjorie Westriding series, known as the Arbai trilogy. Styled as an ecological mystery, it presents one of her earliest and perhaps most radical statements on themes that would come to dominate her fiction, in which despoliation of the planet is explicitly linked to gender and social inequalities. Considered to be among her best work, as well as being a definitive work of science fiction literature, Grass was nominated for both the Hugo and Locus award in 1990. It was included in the SF Masterworks classic science fiction paperback collection in 2002. Generations ago, humans fled to the cosmic anomaly known as Grass. But before humanity arrived, another species had already claimed Grass for its own. It too had developed a culture. Now, a deadly plague is spreading across the stars, leaving no planet untouched, save for Grass. But the secret of the planet's immunity hides a truth so shattering it could mean the end of life itself. In the distant future Terra (Earth) has become massively over-populated and its resources overstretched. Partially as a result of this, the human race has spread out across the galaxy and populated new worlds. One such world is the eponymous Grass, so named because almost its entire surface is covered in multi-coloured prairie. The spread of a seemingly incurable plague across human settlements throughout known space prompts the authoritarian religious rulers of humanity, Sanctity, to send investigators to Grass, the only place the plague does not seem to have affected, in the hope of finding a cure. Given that the mainly aristocratic inhabitants of Grass have developed an obsession with a localised variant of fox hunting using the planet's native fauna in place of the horses, hounds and foxes found on Earth, Sanctity choose the Westriding-Yrarier family, whose equestrian background and upper middle class roots they expect will best enable them to successfully infiltrate the aristocratic society and learn more about the hitherto secretive planet. Grass is the first novel of the Arbai trilogy. The sequels are Raising the Stones and Sideshow. Grass was shortlisted for both the Hugo and Locus SF book awards in 1990. ^ "1990 Award Winners & Nominees". Worlds Without End. Retrieved 2011-01-06.